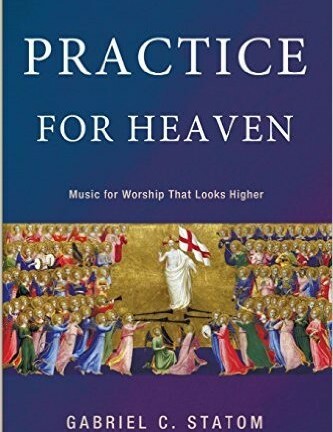 Practice for Heaven: Music for Worship That Looks Higher, by Gabriel C. Statom. Eugene, OR: Wipf & Stock, 2015. 148 pp. $19. A common phrase used among musicians is, “practice makes perfect.” As one practices for anything, the goal is to become better at doing something so that the final performance of the practiced actions may be the best possible. This is idea lies behind Practice for Heaven by Gabriel C. Statom, Director of Music at Second Presbyterian Church in Memphis, Tennessee. The author states that he wants this book to “help musicians develop a philosophy of church music that is grounded in biblical and theological understanding that suggests the role of music in corporate worship should transport the worshiper to the heavenly throne of our God.” Essentially, we are to practice for worship in heaven while here on earth, so we should strive to do it as closely to what heaven looks like. Practice for Heaven is divided into three parts, discussing the following general topics: What We Know about Worship, Music in Worship, and Church Music that Aspires. Part One is a historical and biblical survey of worship and what it has looked like throughout the ages. From a biblical perspective, Statom covers the glimpses into heaven available in the Bible and what we know about worship after the return of Christ. Part Two discusses the musical aspects of worship on earth and begins to compare them to what was discussed about heavenly worship in Part One. The author treats multiple aspects of music in worship including choral, instrumental, and corporate worship music with a brief section on the content within the music. Part Three summarizes the book by discussing common faults in church music and attempting to add some practical application. Then a brief conclusion explains how churches should form their worship philosophies. The author begins to support his thesis by presenting to the reader historical knowledge and traditions that have been included within the church liturgy throughout the ages. Statom also discusses the various pictures of heaven that are given in the Bible such as Isaiah 6 and Revelation. He argues that it is not the place of the worshiper to decide how to come into God’s presence and that worship is primarily for the glory of God and not for the pleasure of mankind (39). Part Two is where Statom begins to more thoroughly discuss the musical aspects of worship and mention which considerations should be given when deciding how to form a worship service. One of his concerns has to do with the lack of congregational participation that occurs during the music portion of a service. He attributes this to decline in school music education, perfectionism, individualism, and sound amplification. One of his solutions for counter-acting this fault in congregational participation is to incorporate choirs within the worship service to “hold a standard for corporate singing” (59). Statom also highly supports the use of the organ because it is a versatile instrument that can easily play the melody of a tune and support the congregation as they sing (62). Part Three takes a more practical approach to music in worship. Here, Statom discusses many common faults that occur with regard to music in worship. An example of this is in his chapter on “Pragmatism in Church Music.” This chapter lists the four most common misunderstandings that are related to pragmatism: an external or mechanical interpretation of worship, an individualistic interpretation, an emotional uplift interpretation, and a performance interpretation. He makes clear that while these four misunderstandings are not directly pragmatic, they are related to pragmatism in some way. The first one focuses on “what works,” and this can be anything from getting people into the worship service or using the worship service as a means of evangelism. The second puts too much focus on the individual worshiper, which Statom argues creates a narcissistic attitude. Third, an emotional uplift is too entertainment focused. Last, a performance interpretation implies that the form of the worship service can be structured based on beliefs and options, which give way to relativism. Statom concludes with a short section on what he believes the philosophy and identity of the corporate church should look like based on the biblical and historic findings presented in his book. Overall, the author has some good points and if one digs deep enough, he can find theological truth in many of his arguments. For example, Statom makes it very clear that all music that is written in the name of Christianity is not to be used within the realm of corporate worship (94). The advent of commercialized Christian music, he argues, has blurred the expectation of what the purpose of music in worship is. The expectation of coming to church to hear a “performance” is becoming more common. He is also right in saying many songs written in contemporary forms are not suitable for corporate worship for various reasons, ranging from tessitura to rhythmic complexity. However, there are many weaknesses throughout this book. The first apparent weakness is the lack of editing. Many times there are grammatical errors and block quotations that are not formatted correctly. While the book is written in a clear, easy-to-read fashion, these careless errors make the book unnecessarily confusing to read. Often, the usage of quotations makes the book feel disjunct, as if little thought was put into the flow of the text. Aside from these editorial considerations many of Statom’s arguments seem weak and unsupported. Within the book, Statom mentions that the guitar is not suitable for use in corporate worship in a larger setting. Assuming only one guitar is used with no amplification he would be correct. However, based on his rationale for the qualities that must be present in an instrument on page 63, his argument falls short. Statom quotes Terry Johnson on the following attributes necessary for an instrument used in corporate worship: “1) Loud enough to effectively support and yet not overwhelm the singing; 2) sophisticated enough to distinctively sound each note; and 3) appropriate, as determined by its inherent qualities and associations.” With amplification, a guitar is sufficient in volume and a skilled guitar player can play the melody of a song effectively. If multiple guitars are used and each play independent parts (rhythm, melody, and bass line), then the congregation can be musically supported. Finally, while it is true the guitar comes with its negative associations, those associations have begun to diminish, gradually making this argument invalid in certain cultural settings. The content covered in this book is important to consider because one should always question what practices are included in a worship service. This book can help ministers of music reconsider how they do things and challenge them to question why they make the decisions they do. Putting aside the editorial mistakes and unsupported arguments, this book is a good launching pad for a dialogue of proper forms of worship and as a reminder to use musical discernment when choosing music of any form for a worship service.